Madam X was an American hard rock band that was formed in Detroit, Michigan, in 1981 by the Petrucci sisters Roxy and Maxine. They later on relocated to New York where they found their vocalist Bret Kaiser. A record deal was also secured with Jet Records boss Don Arden. The band only released one album which was produced by Rick Derringer. A second album was recorded but never released as they no longer had a record deal. Several line-up changes followed, including later to be Skid Row front man Sebastian Bach joining them. The band finally broke up around 1988. 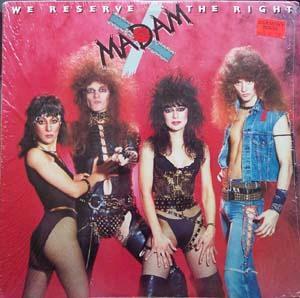 The Petrucci sisters tried to resurrect Madam X in 1991 with an all-female line-up but they didn't last long. Roxy instead formed the more successful band Vixen.